Objective: To study the airflow around the project building & other buildings due to the effect of wind and effect of heat generated by outdoor air conditioners installed in high rise project building on other surrounding buildings in worst case scenario.For wind flow analysis the predominant wind direction of SW with average wind velocities of 3 m/sec in Mumbai is considered based on the ISHRAE weather data. Hence, in worst case scenario all 30 floors with 20 outdoor AC units in each floor were considered for total heat dissipation from the project building. The worst case conditions were simulated for 21st March at 22:00 which is assumed to be a condition when all the ACs were working. At that moment as per ISHRAE weather data the ambient temperature in Mumbai is 26.9 C, same was considered in the CFD analysis. Modelling and Analysis: Based on the provided CAD drawings details of the “Kahprideo project building & surrounding buildings”, the 3D CFD model was prepared. The area of interest for the project building & its surrounding building is 305m width, 340m length & 125.5m height. After preparing the 3 D geometry, the high quality mesh with different hexagonal & tetrahedral mesh was generated with total mesh cells of 8.8 million cells were obtained. The meshed geometry was used for solving the flow & energy equations in “project building & surrounding buildings” with applying the suitable boundary conditions in worst case conditions to see the effect of wind flow around buildings and heat dissipated by outdoor air conditioners on other buildings. 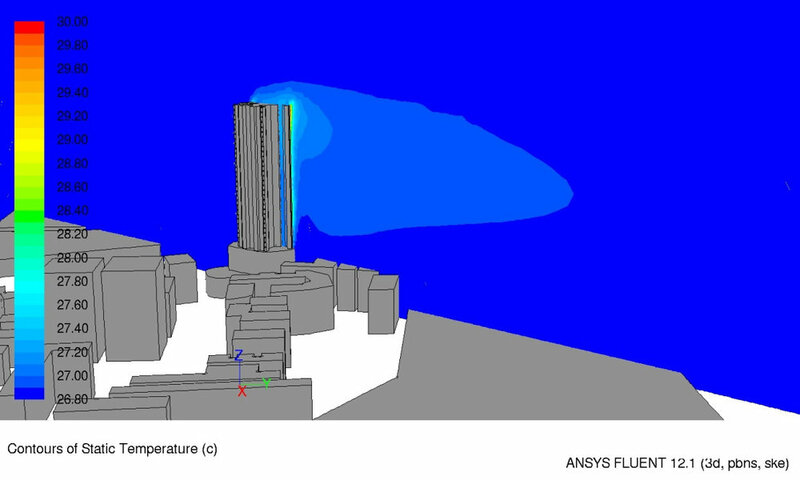 Conclusion: Thus CFD Analysis was carried out to study the airflow around the project building & other buildings due to the effect of wind and also the effect of heat generated by outdoor air conditioners installed in high rise project building on the other surrounding buildings in worst case scenario. From the analysis it was found that the temperatures created due to outdoor air conditioners located in project building were reaching at lower levels to other buildings, however the temperature of this heat wave is 0.8 C above the ambient temperature & this temperature difference is very negligible. However while closely observing all the temperature results it reveals that just few meters away from the project building the temperature dropped to 27.6 C, then after 45m of distance the temperature is dropped to 27.2 C and then after 480m of distance the temperature dropped to ambient conditions. Hence it was concluded that the outdoor air conditioning units placed in the building were slightly affecting the surrounding buildings however it was almost negligible.